Risk mapping is not a process that should be conducted by one person. Every person in your business, from the CEO to the intern, will have different ideas about what risks are most prevalent to your industry. You cannot involve everyone, but ask multiple people from various departments and levels of authority to ensure you are getting unique viewpoints. This will also allow you to discover risks that you may not have previously considered and gain new perspectives on how frequent or severe a risk really is. Simply naming your risks does not allow you to build an effective risk map. You must assess each scenario with a strong understanding of the business and how the risks can impact your ability to continue operations. Think about what is likely to cause the risk and the consequences it will have if it occurs. It is also important to be consistent in how you rank each risk in terms of frequency and severity so that the final product is a clear depiction of how the risks compare to each other. If consulting those within your organization isn't providing a sufficient understanding, look elsewhere. You can try to determine how likely and impactful a risk will be based on your experience and past losses, but what if you’re a start-up company? You can ask an expert: many insurance providers are able to assist with risk management tools, and if not, they can likely suggest someone who can. You can also look at similar organizations and industry statistics to help guide your risk ranking. 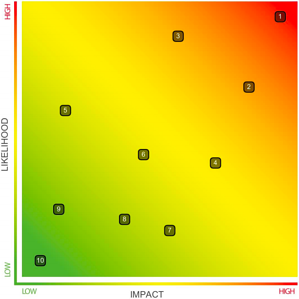 You’ve built your risk map and are now using it to help manage and mitigate – great! But it’s important to remember that your risk landscape is constantly changing. Revisit your rankings with the risk management team at least quarterly, to discuss if the status of any existing risks has changed or if any new risks should be placed on the map. Doing so will ensure that your risk map is a consistently helpful tool that will help you reduce incidents and costs.